Antique / Vintaqe - Salisbury Crown China of England, A 27 Piece Set, Service for Eight, in the "Tyne" Pattern #4025, Circa 1922-27. 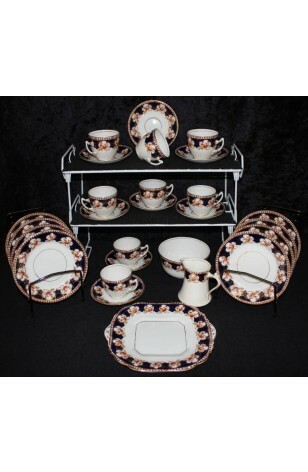 Beautiful Imari "Tyne" Pattern Tea Set by Salisbury Crown China of England. We have a Tea Service for (8) Eight, including Sugar Bowl, Creamer and Cookie Platter.. All in Colbalt Blue, Rust, Green and Yellow Colors. The Pattern is Rust Crosses, Rose Flowers and Colbalt Blue Insets. 22kt Gold is used in the Pattern and on Verges, Feet, Handles and Rims.